The cobra lily (Darlingtonia californica) is a patient and devious predatory plant native to Northern California and Southern Oregon. Also called the California pitcher plant, it has evolved an astonishing set of adaptations that allow it to trap, kill and digest its animal prey using highly modified pitcher-shaped leaves. But what would make a plant select a diet of insect meat? Butterfly Valley, located Plumas Nationa Forest, is one of the only protected cobra lily habitats. Photo by Josh Cassidy/KQED. But Butterfly Valley Botanical Area is a place where the tables are turned. Located in Plumas National Forest, about 150 miles northeast of Sacramento, Butterfly Valley is home to the Darlingtonia bog. More accurately described as a fen, this wetland is home to some amazing carnivorous plants. The combination of cold, slow moving water, nutrient-poor soils and bright sun provide the perfect conditions for cobra lilies to thrive. The cobra lily uses nectar to lure insects into its pitcher traps. Photo by Phi Tran. 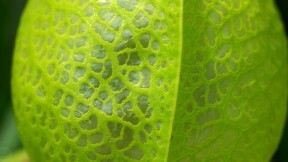 The plants entice insects into their pitcher-shaped traps with an offering of sugary nectar on their long leafy fangs. Insects that land on the plants gorge on the nectar, which leads them to the cobra lillies’ downward facing openings. The entrance to the cobra lily's pitcher trap is curled inwards making it easy for insects to enter, but difficult for them to find the exit once inside. Photo by Josh Cassidy/KQED. Once inside a cobra lily, insects become confused by the light shining down through the transparent windows -- called fenestrations -- at the top of the chamber. 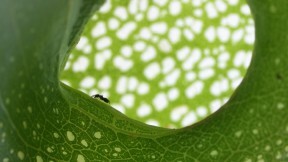 Insects are drawn to light, but the false exits only serve to confuse and tire the plant’s prey. The entrance to the pitcher curls into the chamber obscuring the only way out. After buzzing around within the chamber and repeatedly slamming into the fenestrations, some unlucky insects fall or crawl down into the pitcher’s descending tube. The tube is lined with tiny downward facing hairs to discourage the insects from crawling back up to safety. Exhausted, the insects eventually drown in the puddle of fluid at the bottom of the pitcher. Symbiotic midge larvae and bacteria living in the fluid, assist the cobra lily in digesting the doomed bugs. The plant then absorbs the nutrients through cells that line the inside of the pitcher tube, much the same way that roots absorb nutrients and water from the soil. Carnivorous plants like the cobra lily still collect energy from the sun. But plants also require nutrients, and not all habitats have ideal nutrients in the soil. Carnivorous plants have evolved an alternative method of absorbing the essential nutrients. Instead of depending entirely on their roots to draw nitrogen and phosphorus up from the soil, carnivorous plants can supplement their input by absorbing the nutrients from the carcasses of their insect prey. 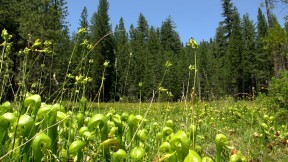 The cobra lily is endemic to Northern California and Southern Oregon. Based on map by Noah Elhardt. By adopting this alternative method of nutrition, the cobra lily is able to thrive in habitats that might otherwise be hostile to plant growth. The plant’s unusual affinity for frigid water and hot sun also make it a poor choice for carnivorous plant enthusiasts hoping to keep a cobra lily at home, since the plant’s preferred habitat is extremely difficult to recreate. Cobra lilies also receive federal protection in Butterfly Valley Botanical Area, so taking one home is not permitted. Those interested in growing carnivorous plants can check out Rice’s book, Growing Carnivorous Plants, or make a visit to California Carnivores, a carnivorous plant shop in Sebastopol, CA. While carnivorous plants seem exotic, North America is actually home to lots of predatory plants.